Brainstorming, hurried lunch meetings, boardroom discussions and late hours. These are not your traditional ideas for a leisurely weekend. That's why business offsites were created. CEOs believe an inspiring location can help promote out-of-the-box thinking. So, be it a weekend golfing break or a team-building adventure escape, such activities have become de rigueur; an accepted and expected excuse to work a little and kick back a lot. Aamby Valley, promoted by the Sahara Group as 'life's finest abodes', is one such offsite destination. 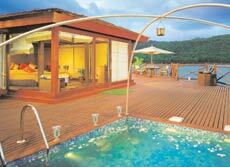 It lies ensconced in the Sahyadri range, along the Western Ghats. The Sahyadris aren't too lofty, but that's a good thing. The gentle roll of these hills makes for a picture-perfect getaway. Each monsoon, the region comes alive with the hills blanketed in every imaginable shade of green. as the call of the crickets intersperses with the patter of the rain. The drive over almost seems to suspend you in space and time. This is especially true if you've endured maddening peak-hour traffic en route. Just a cat's nap away from Lonavla, possibly the most frequented weekend destination near Mumbai and Pune, Aamby Valley is a pristine paradise. It only recently opened its gates to the well-heeled traveller. The din of overcrowded hill stations falls rapidly away as you hit the last bend of the road near the giant gates. Here, the spiraling, monsoonbeaten asphalt quickly transforms into a smooth, mist-shrouded paved road. Chikki sellers disappear from view as do the noisy cars full of holiday revellers. It helps that the Mumbai-Pune expressway, on which Aamby Valley lies, is a bump-free breeze and it takes me little more than three hours to reach. Getting there Aamby Valley lies roughly 120 km from Mumbai and 110 km from Pune, on the Mumbai-Pune expressway. Driving time from Mumbai is about three hours. You could also book a charter flight from Mumbai. ..When to go During the monsoon.. Stay Luxury accomodation options include classic Swiss chalets, Spanish cottages, Burma-teak chalets, waterfront cabanas and luxury tents. .. Eating Out Options include The Legend, an English pub at the golf course; Lagoon a Chinese restaurant and bar and Manuhar, which serves Indian cuisine. ..Meetings The Summit is a fullyequipped convention centre with boardrooms, seminar rooms, banquet halls and business centres. Jet-setters can cut travel time down dramatically. Chartered flights from Mumbai can land at the 1.5 kilometre-long, private airstrip at Aamby Valley's fully-functional airport. By air, you shouldn't take longer than 45 minutes to arrive. Beyond the massive gates, I come across a city that is obsessed with perfection. During the drive from the gates through Aamby Valley's 10,000 acres, I see stringent security checks, staff equipped with walkie-talkies manning public areas, tree-lined pathways, manicured gardens, squeaky clean roads, giant swings, and a manmade lake complete with a brightly-lit sail bridge and an island, which takes centrestage. Corporate travellers now form a significant portion of the profits in the luxury hotel business. Realising this Aamby Valley provides a fitting bouquet of luxury services, which should meet the standards of any discerning business traveller. There are several options for accommodation. These include pinewood chalets straight out of a Swiss countryside; Spanish cottages that make rustic living uber-cool; luxury tents pitched amidst a medicinal orchard and shorefront cabanas that come with a private terrace, outdoor jacuzzi, and a 360-degree view of the valley and lake. I pick the waterfront cabana. It turns out to be a wise choice as I am rewarded the next morning with a view that seems almost made-toorder. Besides the stellar view, my cabana also offers press-of-a-button sophistication to fit the bill of a world-class business-meets-leisure destination. Thanks to superfast wifi, video-conferencing with clients is as smooth as the road to the city. In my case, writing deadlines were easily met in this peaceful and refreshing environment. Up next, is a visit to the golfing greens that are touted as one of the best in the country. For weekend golfers there's no place like this for a quick round. Aamby Valley boasts of a verdant 18-hole course for teeing-off a great business deal; a clubhouse for after-game powerplays and even a quintessential English pub called the Legend, to talk numbers over a pint of stout. Or else, you can choose from an extensive selection of single malts, bourbon and whiskies, as well as a variety of cuban cigars from the in-house humidor. For a bite, one shouldn't miss the sausage platter, a slightly out-of-place but surprisingly scrumptious mini-dosa roll, and some generous steaks. Speaking of gastronomic experiences, one can find myriad food options here, as you can imagine. Savour a delectable brunch spread at the Four Seasons every weekend (it generally comes with your room's continental plan) or a scrumptious Chinese offering at the deck-like Lagoon restaurant and bar -so named as it overlooks the large swimming pool. Done in turquoise and white, it has a menu that leans towards China's spicy Sichuan cuisine. The fiery lobster is a cracking choice here. And if the heat is too much to handle, do sample the pan-friend honey noodles that come with a scoop of vanilla ice cream- the chef's special. Again, the view makes for an absolutely spectacular lunch setting. And after a long day tuck into some comfort food in the privacy of your room with a large deep-dish from their pizza delivery joint called Pizzaz. For some pampering in-between meetings, the city has a downtown club complex that offers a temperature-controlled swimming pool, a spa with Ayurvedic and Swedish massages, and a health zone with a sauna, steam bath and jacuzzi. There's also a hi-tech gymnasium and an indoor dome for table tennis, air hockey, billiards, snooker, and pool tables, all so you can sweat out the stress. There's more: the world-class convention centre, The Summit, houses boardrooms, seminar rooms, and banquet halls to take care of all sorts of business needs. But then come a few odd touches. Take for example the discotheque located a mile from the main concierge desk, high up in the hills (it is figuratively named Mile High). Then there's a 'tea stall' that seems a tad out of place amidst the luxury; and even a 'Benaras Ghat' on the banks of a man-made lake. The security blanket surrounding 'Independent India's First Planned City' can be an overkill at times. If you're looking for a Goa-sque kind of a carefree getaway, you will be disappointed. Then again, Aamby Valey's straightjacketed and uber-formal take on things does seem well-suited to globe-trotting conglomerates who mean business.